With the rapid growth of information technology, it is imperative that our teaching community is provided with the best of tools to perform their everyday activities. Whales For Schools is a great step towards digitizing the daily activities of a teacher. Lesson plans, curriculum plans, class notes, online assignments, messaging, emails, attendance, exam schedules, results and SMSes are integrated in this application to provide a world class collaboration tool for teachers, parents and students. It is extremely affordable, easy to use and mobile enabled. Cryztal Technologies is a Chennai based startup specializing in educational software. We provide infrastructure support, hardware installation, web design, web application development. We can solve your IT problems, provide you new and innovative ideas to take your institution to the next level. SMS could be sent to the entire class, or the individual parent. SMS is also available for notifying absentees and reminding fee defaulters. Various reports like monthly attendance reports, examination results, fee collection reports etc., can be generated easily. Printer-friendly versions are provided wherever necessary. The complete portal is mobile ready. All the functionalities could be used with a smart phone\tablet\laptop or a desktop, the screens adjust to give the best view based on the device being used. The dashboard provides a quick overview of some important information like attendance, upcoming examinations, latest announcements and links to frequently used modules. The teacher can use this module to make important announcements or for conveying a message to the entire class. These announcements are available in the student\parent portal. The teacher can use the class vault to share resources with the class. Any documents\class notes could be shared with the entire class using this feature. Teachers can create questionnaires, that can be shared with the entire class, so that the students can answer them as part of their home assignments. The lesson plans module provides the teachers with a quick way of creating and maintaining a lesson plan. This can save a lot of time for the teachers, as these can be re-used with relevant updates in subsequent years. We have an excellent team to take care of your queries\issues, providing solutions promptly. We also provide on-premises training for teachers\students\parents on the usage of the tool. 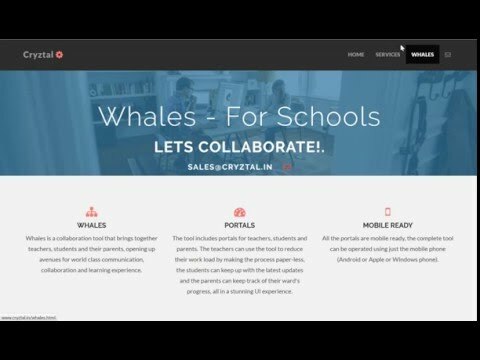 Whales is a collaboration tool that brings together teachers, students and their parents, opening up avenues for world class communication, collaboration and learning experience. This video provides a demonstration of the teacher portal.